The Annual Award Ceremony of the Buddhist School of Adelaide, SA for the year 2018 was held at the Atherston School Hall , Adelaide SA, on January 27 at 3 pm under the patronage of the Incumbent of the temple, Udagabbala Sumedha thera. 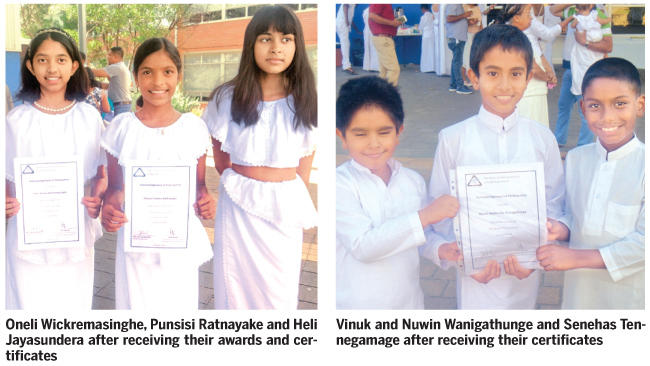 Prizes were awarded to the children residing in Adelaide for Buddhism and Sinhala language and over 200 students from grade 1 to 10 received awards. Parents of the children and well wishers were present. The ‘Dayaka Sabha’ of the temple organised the event.